Our Blog Hop and Giveaway with Lawn Fawn is on Day 4! We have more fabulous projects created by both design teams. Join in on the fun. Read through to the end of the post to enter to win one of the giveaways! Christmas is a few weeks away and I am getting a head’s start on my gift wrapping. I love to decorate my presents. So when I saw these cute Winter Otter and its matching Winter Otter Lawn Cuts dies, I knew what to make – Christmas present tags!! Using Kraft cardstock tags and papers/vellum from my stash, I got right to work! I die-cut many wreath shapes from Mini Wreath, using different kinds of paper (patterned, glitter and vellum) to make the wreath stand out. Each wreath will have four layers. To keep it simple, the otters are in black and white for a nice contrast to the craft cardstock tag! Then, wrap a paper band around each tag and stamp “Merry Christmas” on a piece of white cardstock. To finish, cut the sentiment ends into little fishtail banner. I can’t wait to add them to gifts! Visit my blog for the tutorial, click: Scissors, Glue and Paper! Hey guys, Tracy here and I am super excited to be crafting along on the blog hop. Lawn Fawn’s Year Seven Stamp Set and its matching dies, Year Seven Lawn Cuts caught my eye! Because how could you NOT love these super cute little images?!? Pair these with some of my favourite adhesives, E-Z Runner® Permanent Fine Adhesive and 3D Foam Squares…what do you get? The perfect little birthday card, that’s what! After cutting rows of fringed background, I punched out circles to mat my cute little elements. Next, I secured the die cuts and punches in a combination of E-Z Runner® Permanent Fine Adhesive and 3D Foam Squares for dimension and fun. For all of my project details, hop on over to my blog by clicking: Scrappy Chick Blog. Day 5, click: Lawn Fawn Blog Hop and Giveaway – Day 5! Lawn Fawn Blog Hop and Giveaway – Day 4! If you cannot see the comment section (at the bottom of this post), please click: Lawn Fawn Blog Hop and Giveaway – Day 4 and scroll down to the bottom of the post. This entry was posted in 3D Foam Squares, Adhesives, Announcement, Cards, Crafts & Tutorials, E-Z Runner® Dispensers, Gifts, HomeHobby by 3L, Other Adhesives, Seasonal Craft Ideas, Tutorial, Winter and tagged 3D Foam Squares Mix Black, 3D Foam Squares Regular Black, 3D Foam Squares Small Black, Adhesive Essential Kit, Birthday, Blog Hop, Card, Card Making, Christmas, Dual Tip Glue Pen, E-Z Runner Permanent Fine, E-Z Runner Permanent Strips, E-Z Runner Permanent Strips Refill, E-Z Runner Permanent Strips Refillable, E-Z Runner Permanent Strips Refillable Value Pack, Gift Tag, Holiday, HomeHobby by 3L, Jana Maiwald-McCarthy, Lawn Fawn, Tag, Tracy McLennon. Bookmark the permalink. 68 Responses to "Lawn Fawn Blog Hop and Giveaway – Day 4"
Love today’s creations. They inspire me to create. Love both projects. I need to try that colorful fringe background soon. More fun creations today. Love the sweet tags. Oh my gosh those tags are sweet! I love the layering! 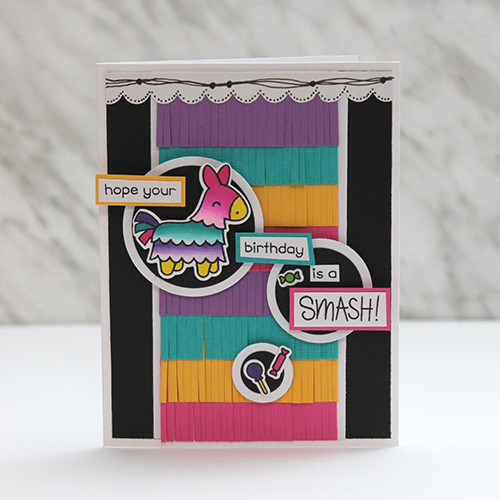 The piñata card is perfect too! The tags are adorable. I love the otters inside the wreath. Awww!!! How cute!!! Love those little otters!!! 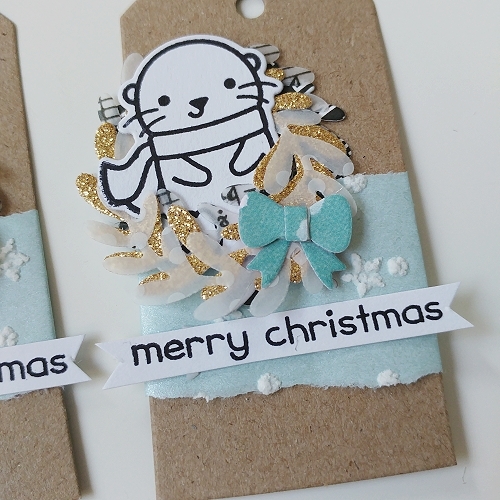 Love these little tags, especially the wreaths being wrapped around the otter.. Cute idea. The white otters are so cute! I never would have thought of that. Awesome projects. Fantastic projects! I love the otter tags. 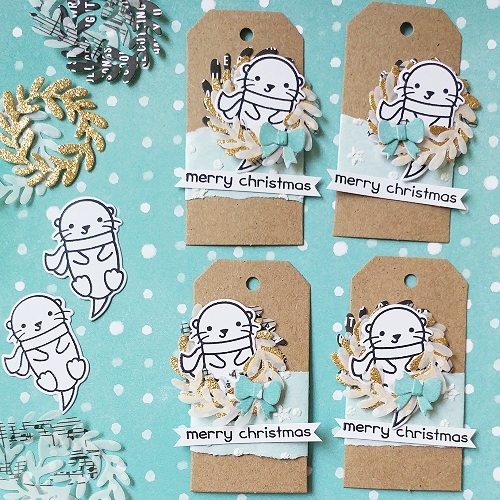 Like the cute Winter Otter & wreath tags. Like the whimsy of the birthday card with pinata. Love the tags and fringed card! Such fun projects! Excited to get some of the 3D Foam Squares in black… they will really come in handy! Colorful fringe card and I like the wreath and the kraft for the cute otter tags. Love Love Love! The fact that the stamps were still used without colouring it in, is such a fab idea! I would never have thought to leave the otter plain white but I just love it. Those tags are adorable! The gold wreath adds just the right sparkle. The fringe card would be so fun to recreate. So cute and colourful too. Love it. The little bear is so cute. Great cards, I bought the otter set as well and am having fun playing with it! Hands down those Winter Otter tags are the most gorgeous thing I have ever seen! Both projects are adorable. I like the otters and what you have created with them. Love the fringe on the card with the llama! I love the tags and the card!!! Super cute otter and piñata cards!!! Love the otters all snuggled in their wreath nests and what a great design for the Piñata stamp set! I haven’t used mine yet and pinned it for inspiration! Beautiful Christmas tags!The birthday card is also super cute!Thank you for sharing and a chance to win! Aww — such wonderful creations!! Too darn cute! Awesome tags!!! I love kraft around the holidays… and I love how the image was kept in it’s original state! 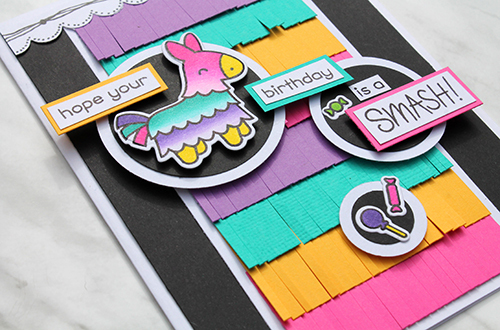 And the fringed card is so colorful, so fun!!! Thanks for the inspiration!! The otters are so cute! And love the vibrant festive colors on Tracy’s fun card. I love these tags. I can see them on gifts wrapped in Kraft, turquoise, and silver papers. What a treat for the lucky recipients. Gorgeous projects. Love the colourful fringes. So very creative. Again today, these are two adorable creations and perfectly executed !! Love both projects! Will definitely use some of these elements in my upcoming creations. Thanks for sharing! Such cute cards! The mini wreath encircling that otter is fantastic and I love the fringe on the pinata card. Both projects turned out adorable! I love how the fringe was used on the piñata card! The otter cards are so darling and I love the glitter and vellum bits. Also loving the fun fringe on the pinata design! I love the fringe look, and can’t wait to use it on a card! Adorable otter gift tags. Having the otter tucked in the wreath is so creative. This is my most favorite day of the blog hop so far! Such cute, fun, and colorful ideas! I LOVE THEM ALL! I can’t get over how cute those otter tags are! I love the glitter and vellum wreaths, as if they aren’t already cute enough. Lawn Fawn and Scrapbook Adhesive wow what a great combination. Lawn Fawn has such fun critters and such that it makes it fun to attach them everywhere. LOVE these soo much !! Awesome cards, and nice coloring! ? The tags are way too adorable!!! Gorgeous card! What fabulous projects today!! Those little Christmas otter tags are adorable and the fringed background and little unicorn is so creative. I love it!! Thanks for sharing today. The gift tags are so adorable and your card is so pretty and festive!! Really cute! I absolutely adore those tags!